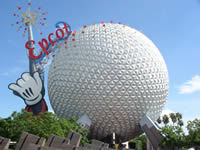 We chose to go to Epcot center and Disneyworld on our babymoon. We struggled to get pregnant and we were so happy. Both my wife and I loved Epcot center so we decided to take a vacation there. She had a rough first trimester, so a vacation was a welcome relief. It was romantic because it was an example of things to come and it was great alone time. We enjoyed a couple of great romantic dinners at the seafood restaurant and the Italian restaurant. It was also very enjoyable watching all of the kids enjoy their time at Disneyworld and we looked forward to the day when our child would do the same. We decided that we are going to take our daughter when she turns two. The most romantic part of the whole trip was when the sunset over the lake by Epcot. We ended up buying a lot of souvenirs for our baby's room. Florida is one of the most popular destinations for babymooning couples. Check out our Florida Babymoon Page for lots of great babymoon vacation packages.